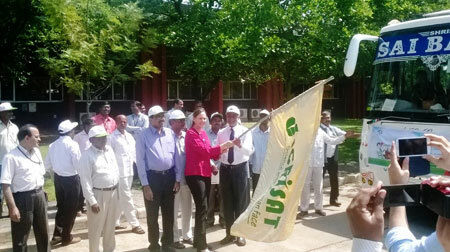 ICRISAT Strategic Marketing and Communication Director, Ms Joanna Kane-Potaka and Dr D Rama Rao, National Director, NAIP flag off a bus carrying the participants of the tour at the ICRISAT global headquarters. Hyderabad, India (11 May 2014) – A train journey to promote cross learning among farmers across India was kick-started today with the first of five Agro-tech and business opportunities expos scheduled to take place in five cities – from Hyderabad to Nagpur, Bhopal, Mathura and New Delhi. Krishi Parivartan Yatra (meaning, a journey of agricultural transformation) takes 50 farmers and entrepreneurs who are beneficiaries of the World Bank-funded National Agriculture Innovation Project (NAIP) of the Indian Council of Agricultural Research (ICAR), on a five-city tour to share new technologies and agri-ventures with fellow farmers. The first expo held today at the International Crops Research Institute for the Semi-Arid Tropics (ICRISAT) in Hyderabad showcased the best of innovations and enterprises developed through NAIP. Parallel sessions and discussions were held, where NAIP farmer beneficiaries shared their success stories with about 200 farmers and entrepreneurs and promoted the tremendous potential of agribusiness in boosting the transformation of Indian agriculture. The train journey was then flagged from ICRISAT’s global headquarters in Hyderabad for the five-city tour. “Innovation in agriculture is widely considered as the key to achieve food security. To actualize this vast untapped potential of Indian agriculture, this Krishi Parivartan Yatra is being organized to bring to the fore, the unlimited opportunities that agriculture and agribusiness offer,” said Dr D Rama Rao, National Director, NAIP at the inaugural session of the Yatra. “Our mission is to make smallholder farmers in the drylands prosperous, not just self-sufficient. And that is why we are engaged in promoting an inclusive and technology-based entrepreneurship and agribusiness program,” said Ms Joanna Kane-Potaka, Strategic Marketing and Communication Director, representing ICRISAT Director General Dr William Dar. “ICRISAT’s Agri-Business Incubation (ABI) Program has supported more than 200 agribusiness ventures and benefited over 500,000 farmers in Andhra Pradesh and neighboring states. We have identified and supported some very good innovative products and technologies and taken them to the market. The Krishi Parivartan Yatra supports our goal to bring together the best of agri-ventures and enterprises to improve the livelihoods of smallholder farmers,” said SM Karuppanchetty, Chief Operating Officer, ICRISAT-ABI. The train journey, along with the just concluded Agri-Biz Idol Camps held in various cities on 5-9 May to reach out to the youth and start-up entrepreneurs, will both culminate in the Agri-Innovation Conclave on 18-19 May in New Delhi. The conclave aims to bring together agribusiness experts, professionals, and other stakeholders from across the country, on a common platform to share NAIP’s success and conceive path breaking ideas for strengthening the future of agribusiness in India. NAIP-ICAR has embarked on this unique initiative to promote awareness on the potential opportunities in agri-business, nurture agri-innovators for future generations, and also to promote the various business incubation services offered by NAIP's Business Planning and Development (BPD) units. The BPDs which primarily act as agriculture incubation centers help start-ups or entrepreneurs foraying into agribusiness to flourish by providing comprehensive business solutions. Over the last five years, 22 agribusiness incubators (BPDs) have been set up throughout India in agricultural universities and research institutes by NAIP-ICAR with support and mentoring by ICRISAT-ABI. The success has led to ICRISAT and ICAR sharing their expertise across the continents to Africa, to coordinate the setting up of food business incubators and food technology laboratories in 10 African countries.